Researchers in China have uncovered the skeletal remains of an unusually tall group of individuals who lived in China’s Shandong province some 5,000 years ago. With some reaching heights well over six feet, these Neolithic humans were a sign of things to come. As reported in Xinhua, an archaeological dig at Jiaojia village in Jinan City’s Zhangqiu District has unearthed 104 houses, 205 graves, and 20 sacrificial pits. Pottery and various jade items were also uncovered. 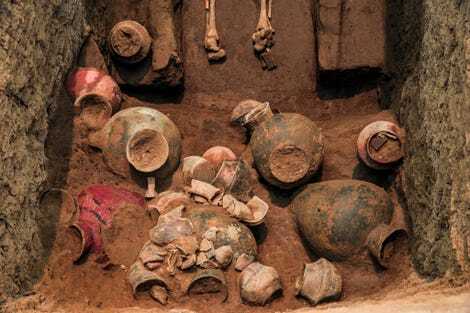 The Late Neolithic site dates back to a time when the Yellow River Valley was inhabited by the Longshan Culture, also known as the Black Pottery Culture, who thrived in the area from around 3000 to 1900 BC. The archaeological dig, which began last year, is being led by the University of Shandong. Their unusual height was probably the consequence of both genetics and the environment. In fact, height remains a defining characteristic of people living in the province today. In 2015, the average height of 18-year-old Shandong men was 5'9", a full two inches taller than the national average. But for the Longshan people, environment could have played an equally important role. As lead archaeologist Fang Hui explained to Xinhua, this Late Neolithic civilisation engaged in agriculture, so villagers had access to a diverse array of nutritious foods. Millet was a major crop at the time, and pigs were an important livestock. This steady diet, said Hui, had an affect on their physical proportions, including height. 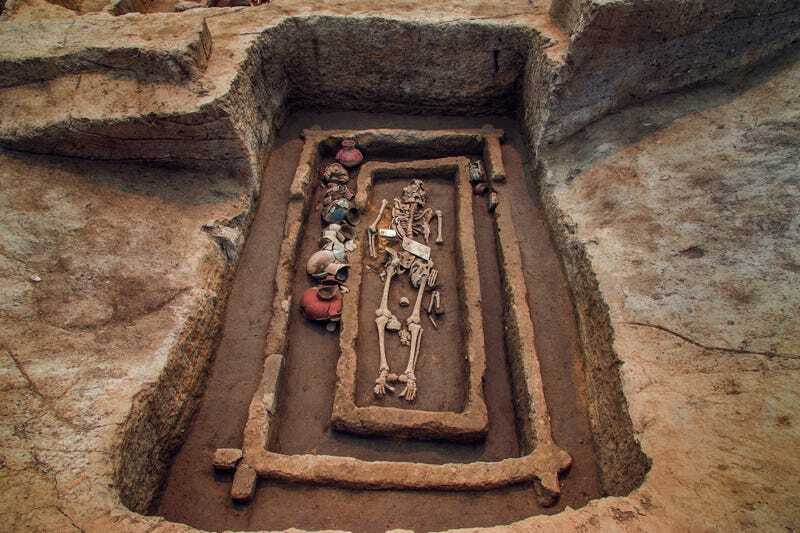 Interestingly, the tallest Longshan men were found in tombs, which the Shandong archaeologists attributed to higher social status and access to better food. As noted, most prehistoric humans were short in comparison to the Longshan people, having less access to a balanced diet, a steady flow of nutritious foods, and possibly having to live through harsh environmental conditions. The Central American Mayan people, for example, were among the shortest of the prehistoric humans, featuring an average male height of 5'2" and an average female height of 4'8". But height may have emerged as an advantageous genetic trait among certain populations well before the Neolithic era and the Longshan people. A recent study from Masaryk University proposed that genes for tallness appeared among the Gravettian culture — a band of hunter-gatherers who lived in Southern Italy some 50,000 to 10,000 years ago. These Upper Paleolithic Europeans, the tallest of whom stood at 5'10, were mammoth hunters, which may have had something to do with their height. “I suspect that this big game specialisation associated with a surplus of high-quality proteins and low population density created environmental conditions leading to the selection of exceptionally tall males,” said the study’s lead author Pavel Grasgruber in an interview with Seeker. This may explain why Europeans from the Dinaric Alps (Albanians and South Slavs in particular) who are genetically related to the Gravettins are so tall to this very day. But tallness isn’t exclusive to Europeans; other unusually tall humans include the Tibetan Khampas people, and the Nilotic people of Sudan. Determining why certain groups of people are shorter or taller than others remains an inexact science owing to so many variables. We’ve reached out to several experts to get their input on this subject, and will update if we get an interesting response. We may never know why the Longshan people were so tall, but given that humans have never been taller than they are today, these ancient humans were most certainly a sign of things to come.